Need To Hire A Boat? "Our Seaforce day was THE favorite activity of our two and a half week visit to Scotland." Welcome To The Exciting World Of Fast Powerboats. Seaforce provides fast boat trips from our base at the Tall Ship next to the Riverside Museum in Glasgow. The Original and most fun and most popular fast boat trip on the Clyde the "Clyde Ride"
The Day Away Kilcreggan Fast Boat Trip For Lunch Touring the Upper Estuary. 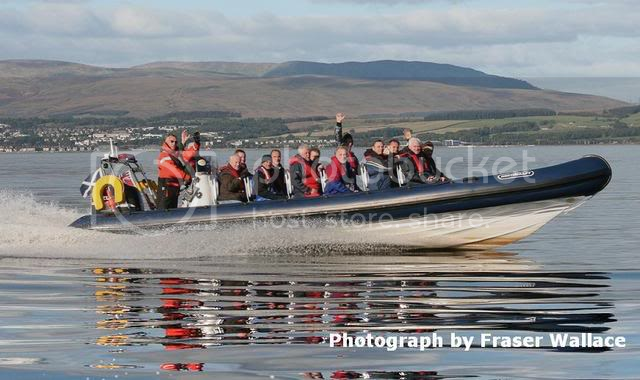 The Rothesey, Isle Of Bute Fast Boat Trip. A Great Full Day Away! We strongly believe in a welcoming service, delivered in a safe professional manner but in an altogether relaxed, friendly atmosphere, it should be fun after all! Our Very Experienced Skippers Hold Advanced Commerically Endorsed MCA Licenses To Carry Passengers And Go Through Years Of Training Before Skippering Our Glasgow Fast Boat Trips.